This article is about the concept of triage as it occurs in medical emergencies and disasters. For other uses, see Triage (disambiguation). Triage station at the Pentagon after the impact of American Airlines Flight 77 during the September 11, 2001 attacks. Triage (/ˈtriːɑːʒ, triˈɑːʒ/) is the process of determining the priority of patients' treatments based on the severity of their condition. This rations patient treatment efficiently when resources are insufficient for all to be treated immediately. The term comes from the French verb trier, meaning to separate, sort, sift or select. Triage may result in determining the order and priority of emergency treatment, the order and priority of emergency transport, or the transport destination for the patient. Triage may also be used for patients arriving at the emergency department, or telephoning medical advice systems, among others. This article deals with the concept of triage as it occurs in medical emergencies, including the prehospital setting, disasters, and emergency department treatment. For many emergency medical services (EMS) systems, a similar model may sometimes still be applied. In the earliest stages of an incident, such as when one or two paramedics exist to twenty or more patients, practicality demands that the above, more "primitive" model will be used. However, once a full response has occurred and many hands are available, paramedics will usually use the model included in their service policy and standing orders. As medical technology has advanced, so have modern approaches to triage, which are increasingly based on scientific models. The categorizations of the victims are frequently the result of triage scores based on specific physiological assessment findings. Some models, such as the START model may be algorithm-based. As triage concepts become more sophisticated, triage guidance is also evolving into both software and hardware decision support products for use by caregivers in both hospitals and the field. 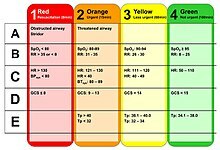 Vital signs defining the colour-coded triage. RR: respiratory rate; SpO2: saturation of peripheral oxygen (pulse oxymetry); HR: heart rate; GCS: Glasgow Coma Score; Tp: temperature. Abnormal vital signs are strong predictors for intensive care unit admission and in-hospital mortality in adults triaged in the emergency department. Simple triage is usually used in a scene of an accident or "mass-casualty incident" (MCI), in order to sort patients into those who need critical attention and immediate transport to the hospital and those with less serious injuries. This step can be started before transportation becomes available. Upon completion of the initial assessment by physicians, nurses or paramedical personnel, each patient may be labelled which may identify the patient, display assessment findings, and identify the priority of the patient's need for medical treatment and transport from the emergency scene. At its most primitive, patients may be simply marked with coloured flagging tape or with marker pens. Pre-printed cards for this purpose are known as a triage tags. bear record of assessment findings. identify the priority of the patient's need for medical treatment and transport from the emergency scene. track the patients' progress through the triage process. identify additional hazards such as contamination. Triage tags may take a variety of forms. Some countries use a nationally standardized triage tag, while in other countries commercially available triage tags are used, and these will vary by jurisdictional choice. The most commonly used commercial systems include the METTAG, the SMARTTAG, E/T LIGHT tm and the CRUCIFORM systems. More advanced tagging systems incorporate special markers to indicate whether or not patients have been contaminated by hazardous materials, and also tear off strips for tracking the movement of patients through the process. Some of these tracking systems are beginning to incorporate the use of handheld computers, and in some cases, bar code scanners. For classifications, see the specific section for that topic. In advanced triage, specially trained doctors, nurses and paramedics may decide that some seriously injured people should not receive advanced care because they are unlikely to survive. It is used to divert scarce resources away from patients with little chance of survival in order to increase the chances for others with higher likelihoods. The use of advanced triage may become necessary when medical professionals decide that the medical resources available are not sufficient to treat all the people who need help. The treatment being prioritized can include the time spent on medical care, or drugs or other limited resources. This has happened in disasters such as terrorist attacks, mass shootings, volcanic eruptions, earthquakes, tornadoes, thunderstorms, and rail accidents. In these cases some percentage of patients will die regardless of medical care because of the severity of their injuries. Others would live if given immediate medical care, but would die without it. In these extreme situations, any medical care given to people who will die anyway can be considered to be care withdrawn from others who might have survived (or perhaps suffered less severe disability from their injuries) had they been treated instead. It becomes the task of the disaster medical authorities to set aside some victims as hopeless, to avoid trying to save one life at the expense of several others. If immediate treatment is successful, the patient may improve (although this may be temporary) and this improvement may allow the patient to be categorized to a lower priority in the short term. Triage should be a continuous process and categories should be checked regularly to ensure that the priority remains correct given the patient's condition. A trauma score is invariably taken when the victim first comes into hospital and subsequent trauma scores are taken to account for any changes in the victim's physiological parameters. If a record is maintained, the receiving hospital doctor can see a trauma score time series from the start of the incident, which may allow definitive treatment earlier. Usually, triage refers to prioritizing admission. A similar process can be applied to discharging patients early when the medical system is stressed. This process has been called "reverse triage". During a "surge" in demand, such as immediately after a natural disaster, many hospital beds will be occupied by regular non-critical patients. To accommodate a greater number of the new critical patients, the existing patients may be triaged, and those who will not need immediate care can be discharged until the surge has dissipated, for example through the establishment of temporary medical facilities in the region. Undertriage is underestimating the severity of an illness or injury. An example of this would be categorizing a Priority 1 (Immediate) patient as a Priority 2 (Delayed) or Priority 3 (Minimal). Historically, acceptable undertriage rates have been deemed 5% or less. Overtriage is the overestimating of the severity of an illness or injury. An example of this would be categorizing a Priority 3 (Minimal) patient as a Priority 2 (Delayed) or Priority 1 (Immediate). Acceptable overtriage rates have been typically up to 50% in an effort to avoid undertriage. Some studies suggest that overtriage is less likely to occur when triaging is performed by hospital medical teams, rather than paramedics or EMTs. In telephone triage, decision makers over the phone must effectively assess the patient's symptoms and provide directives based on the urgency. This should be done in a timely fashion while meeting standard guidelines in order to prevent symptoms from worsening. This section is for general concepts in triage-based treatment options and outcomes. For specific triage systems and methods see the sections dedicated to that topic. For patients that have a poor prognosis and are expected to die regardless of the medical treatment available, palliative care such as painkillers may be given to ease suffering before they die. In the field, triage sets priorities for evacuation or relocation to other care facilities. Alternative care facilities are places that are set up for the care of large numbers of patients, or are places that could be so set up. Examples include schools, sports stadiums, and large camps that can be prepared and used for the care, feeding, and holding of large numbers of victims of a mass casualty or other type of event. Such improvised facilities are generally developed in cooperation with the local hospital, which sees them as a strategy for creating surge capacity. While hospitals remain the preferred destination for all patients, during a mass casualty event such improvised facilities may be required in order to divert low-acuity patients away from hospitals in order to prevent the hospitals becoming overwhelmed. In advanced triage systems, secondary triage is typically implemented by emergency nurses, skilled paramedics, or battlefield medical personnel within the emergency departments of hospitals during disasters, injured people are sorted into five categories. Some crippling injuries, even if not life-threatening, may be elevated in priority based on the available capabilities. During peacetime, most amputation injuries may be triaged "Red" because surgical reattachment must take place within minutes, even though in all probability the person will not die without a thumb or hand. This section is for examples of specific triage systems and methods. For general triage concepts, see the sections for types of triage, treatment options, and outcomes. During the early stages of an incident, first responders may be overwhelmed by the scope of patients and injuries. One valuable technique is the Patient Assist Method (PAM). The responders quickly establish a casualty collection point (CCP) and advise, either by yelling, or over a loudspeaker, that "anyone requiring assistance should move to the selected area (CCP)". This does several things at once, it identifies patients that are not so severely injured, that they need immediate help, it physically clears the scene, and provides possible assistants to the responders. As those who can move, do so, the responders then ask, "anyone who still needs assistance, yell out or raise your hands"; this further identifies patients who are responsive, yet maybe unable to move. Now the responders can rapidly assess the remaining patients who are either expectant, or are in need of immediate aid. From that point the first responder is quickly able to identify those in need of immediate attention, while not being distracted or overwhelmed by the magnitude of the situation. Using this method assumes the ability to hear. Deaf, partially deaf, or victims of a large blast injury may not be able to hear these instructions. In Western Europe the Triage Revised Trauma Score (TRTS) is sometimes used and integrated into triage cards. The Injury Severity Score (ISS) is another example of a trauma scoring system. This assigns a score from 0 to 75 based on severity of injury to the human body divided into three categories: A (face/neck/head), B(thorax/abdomen), C(extremities/external/skin). Each category is scored from 0 to 5 using the Abbreviated Injury Scale, from uninjured to critically injured, which is then squared and summed to create the ISS. A score of 6, for "unsurvivable", can also be used for any of the three categories, and automatically sets the score to 75 regardless of other scores. Depending on the triage situation, this may indicate either that the patient is a first priority for care, or that he or she will not receive care owing to the need to conserve care for more likely survivors. S.T.A.R.T. (Simple Triage and Rapid Treatment) is a simple triage system that can be performed by lightly trained lay and emergency personnel in emergencies. It is not intended to supersede or instruct medical personnel or techniques. It has been taught to California emergency workers for use in earthquakes. It was developed at Hoag Hospital in Newport Beach, California for use by emergency services. It has been field-proven in mass casualty incidents such as train wrecks and bus accidents. Though it was developed by community emergency response teams (CERTs) and firefighters after earthquakes. Deceased are left where they fell. These include those who aren't breathing and repositioning their airway efforts were unsuccessful. Immediate or Priority 1 (red) evacuation by MEDEVAC if available or ambulance as they need advanced medical care at once or within 1 hour. These people are in critical condition and would die without immediate assistance. Delayed or Priority 2 (yellow) can have their medical evacuation delayed until all immediate people have been transported. These people are in stable condition but require medical assistance. Minor or Priority 3 (green) are not evacuated until all immediate and delayed persons have been evacuated. These will not need advanced medical care for at least several hours. Continue to re-triage in case their condition worsens. These people are able to walk, and may only need bandages and antiseptic. The JumpSTART pediatric triage MCI triage tool is a variation of the S.T.A.R.T. model. Both systems are used to sort patients into categories at mass casualty incidents (MCIs). However, JumpSTART was designed specifically for triaging children in disaster settings. Though JumpSTART was developed for use in children from infancy to age 8, where age is not immediately obvious, it is used in any patient who appears to be a child (patients who appear to be young adults are triaged using START). Within the hospital system, the first stage on arrival at the emergency department is assessment by the hospital triage nurse. This nurse will evaluate the patient's condition, as well as any changes, and will determine their priority for admission to the emergency department and also for treatment. Once emergency assessment and treatment are complete, the patient may need to be referred to the hospital's internal triage system. For a typical inpatient hospital triage system, a triage nurse or physician will either field requests for admission from the ER physician on patients needing admission or from physicians taking care of patients from other floors who can be transferred because they no longer need that level of care (i.e. intensive care unit patient is stable for the medical floor). This helps patient flow more efficient in the hospital. This triage position is often done by a hospitalist. A major factor contributing to the triage decision is available hospital bed space. The triage hospitalist must determine, in conjunction with a hospital's "bed control" and admitting team, what beds are available for optimal utilization of resources in order to provide safe care to all patients. A typical surgical team will have their own system of triage for trauma and general surgery patients. This is also true for neurology and neurosurgical services. The overall goal of triage, in this system, is to both determine if a patient is appropriate for a given level of care and to ensure that hospital resources are utilized effectively. In an advanced triage process injured people are sorted into categories. Conventionally there are five classifications with corresponding colors and numbers although this may vary by region. Black / Expectant: They are so severely injured that they will die of their injuries, possibly in hours or days (large-area burns, severe trauma, lethal radiation dose), or in life-threatening medical crisis that they are unlikely to survive given the care available (cardiac arrest, septic shock, severe head or chest wounds); their treatment is usually palliative, such as being given painkillers, to reduce suffering. Red / Immediate: They require immediate surgery or other life-saving intervention, and have first priority for surgical teams or transport to advanced facilities; they "cannot wait" but are likely to survive with immediate treatment. Yellow / Observation: Their condition is stable for the moment but requires watching by trained persons and frequent re-triage, will need hospital care (and would receive immediate priority care under "normal" circumstances). Green / Wait (walking wounded): They will require a doctor's care in several hours or days but not immediately, may wait for a number of hours or be told to go home and come back the next day (broken bones without compound fractures, many soft tissue injuries). White / Dismiss (walking wounded): They have minor injuries; first aid and home care are sufficient, a doctor's care is not required. Injuries are along the lines of cuts and scrapes, or minor burns. The Australasian Triage Scale (abbreviated ATS and formally known as the National Triage Scale) is a triage system that is implemented in both Australia and New Zealand. The scale has been in use since 1994. The scale consists of 5 levels, with 1 being the most critical (resuscitation), and 5 being the least critical (nonurgent). In the mid-1980s, The Victoria General Hospital, in Halifax, Nova Scotia, Canada, introduced paramedic triage in its Emergency Department. Unlike all other centres in North America that employ physician and primarily nurse triage models, this hospital began the practice of employing Primary Care level paramedics to perform triage upon entry to the Emergency Department. In 1997, following the amalgamation of two of the city's largest hospitals, the Emergency Department at the Victoria General closed. The paramedic triage system was moved to the city's only remaining adult emergency department, located at the New Halifax Infirmary. In 2006, a triage protocol on whom to exclude from treatment during a flu pandemic was written by a team of critical-care doctors at the behest of the Ontario government. For routine emergencies, many locales in Canada now employ the Canadian Triage and Acuity Scale (CTAS) for all incoming patients. The system categorizes patients by both injury and physiological findings, and ranks them by severity from 1–5 (1 being highest). The model is used by both paramedics and E/R nurses, and also for pre-arrival notifications in some cases. The model provides a common frame of reference for both nurses and paramedics, although the two groups do not always agree on scoring. It also provides a method, in some communities, for benchmarking the accuracy of pre-triage of calls using AMPDS (What percentage of emergency calls have return priorities of CTAS 1,2,3, etc.) and these findings are reported as part of a municipal performance benchmarking initiative in Ontario. Curiously enough the model is not currently used for mass casualty triage, and is replaced by the START protocol and METTAG triage tags. Triage at an accident scene is performed by a paramedic or an emergency physician, using the four-level scale of Can wait, Has to wait, Cannot wait, and Lost. UMP: urgence médico-psychologique (medical-psychological urgency) or impliqué (implied, i.e. lightly wounded or just psychologically shocked). This triage is performed by a physician called médecin trieur (sorting medic). This triage is usually performed at the field hospital (PMA–poste médical avancé, i.e. forward medical post). The absolute urgencies are usually treated onsite (the PMA has an operating room) or evacuated to a hospital. The relative urgencies are just placed under watch, waiting for an evacuation. The involved are addressed to another structure called the CUMP–Cellule d'urgence médico-psychologique (medical-psychological urgency cell); this is a resting zone, with food and possibly temporary lodging, and a psychologist to take care of the brief reactive psychosis and avoid post-traumatic stress disorder. In the emergency department of a hospital, the triage is performed by a physician called MAO–médecin d'accueil et d'orientation (reception and orientation physician), and a nurse called IOA– infirmière d'organisation et d'accueil (organisation and reception nurse). Some hospitals and SAMU organisations now use the "Cruciform" card referred to elsewhere. France has also a Phone Triage system for Medical Emergencies Phone Demands in its Samu Medical Regulation Centers through the 15 medical free national hot line. "Medical Doctor Regulator" decides what is to be the most efficient solution = Emergency Telemedecine or dispatch of an Ambulance, a General Practitioner or a Physician+ Nurse + Ambulance Man, Hospital based MICU (Mobile Intensive Care Unit). Preliminary assessment of injuries is usually done by the first ambulance crew on scene, with this role being assumed by the first doctor arriving at the scene. As a rule, there will be no cardiopulmonary resuscitation, so patients who do not breathe on their own or develop circulation after their airways are cleared will be tagged "deceased". Also, not every major injury automatically qualifies for a red tag. A patient with a traumatic amputation of the forearm might just be tagged yellow, have the bleeding stopped, and then be sent to a hospital when possible. After the preliminary assessment, a more specific and definite triage will follow, as soon as patients are brought to a field treatment facility. There, they will be disrobed and fully examined by an emergency physician. This will take approximately 90 seconds per patient. In Hong Kong, triage in Accident & Emergency Departments is performed by experienced registered nurses, patients are divided into five triage categories: Critical, Emergency, Urgent, Semi-urgent and Non-urgent. Category I: Used for viable victims with potentially life-threatening conditions. Category II: Used for victims with non-life-threatening injuries, but who urgently require treatment. Category III: Used for victims with minor injuries that do not require ambulance transport. Category 0: Used for victims who are dead, or whose injuries make survival unlikely. The Sistema Estructurado de Triaje (SET), which is an adaptation of the Model Andorrà de Triatge (MAT). The system uses 650 reasons for medical appointment in 32 symptomatic categories, that together with some patient information and basic exploratory data, classifies the emergency within 5 levels of urgency. The "Manchester", based on the system with the same name in the UK, use 51 reasons for consultation. Through some yes/no questions, addressed in a diagram, it classifies the emergency in 5 severities. Some autonomous communities in Spain, like Navarre and the Valencian Community, have created their own systems for the community own hospitals. In the UK, the commonly used triage system is the Smart Incident Command System, taught on the MIMMS (Major Incident Medical Management (and) Support) training program. The UK Armed Forces use this system on operations. This grades casualties from Priority 1 (needs immediate treatment) to Priority 3 (can wait for delayed treatment). There is an additional Priority 4 (expectant, likely to die even with treatment) but the use of this category requires senior medical authority. Minimal: Known as walking wounded or uninjured, green classified individuals typically require very little medical aid if any. Their injuries are minor, usually scrapes, cuts, and bruising with normal capillary refill. They can walk, function freely without assistance, are cognizant, and able to respond accurately to questioning. These individuals will sometimes be asked to assist the responder with transport and applying direct aid to other victims. They will afterwards be staged in an area to be checked more thoroughly later. Injured - Moderate: Yellow individuals require medical attention but it is not needed immediately. Individuals in this category may have cuts, bruises, lacerations, some confusion, minor fractures, and a capillary refill between 4 and 7 seconds (sometimes longer in cold environments). Field dressing of the wounds is usually applied quickly. Fractures are stabilized and individuals listed as green will be asked to assist with collection of yellow individuals for transport to the medical staging area. Immediate - Severe: Red requires immediate medical attention and will not survive if not seen soon. A person with a severe head injury, multiple fractures to the skeletal system, fractures in delicate areas such as the spinal cord, massive confusion, in-cohesive, unable to answer simple questions, unresponsive but with vital signs, arterial bleeding, internal bleeding, or capillary refill exceeding 7 seconds is classified red. Immediate aid is applied to stop external arterial bleeding and airways are adjusted to ensure un-obstruction as they are carefully moved to a medical staging area, usually with the aid of those marked green or unable to provide medical assistance. Presumed Deceased: Individuals listed as black have died. The person's pulse and breathing is checked to confirm no vitals present. In low scale disaster with few victims involved, immediate CPR is started in attempt to revive the vital signs. In larger events with more victims, the head is positioned to open the airway, the body is rolled onto its side and the responder will move on to the next victim. The positioning is done so if the body's vitals return, vomiting will not be as likely to choke the victim. The bodies will not be collected until all surviving individuals have been removed from the immediate disaster area. There will be a body collection staging area set up away from any medical staging areas. Usually this will begin the recovery phase. A battlefield situation, however, requires medics and corpsmen to rank casualties for precedence in MEDEVAC or CASEVAC. The casualties are then transported to a higher level of care, either a Forward Surgical Team or Combat Support Hospital and re-triaged by a nurse or doctor. In a combat situation, the triage system is based solely on resources and ability to save the maximum number of lives within the means of the hospital supplies and personnel. Immediate: The casualty requires immediate medical attention and will not survive if not treated soon. Any compromise to the casualty's respiration, hemorrhage control, or shock control could be fatal. Delayed: The casualty requires medical attention within 6 hours. Injuries are potentially life-threatening, but can wait until the Immediate casualties are stabilized and evacuated. Minimal: "Walking wounded," the casualty requires medical attention when all higher priority patients have been evacuated, and may not require stabilization or monitoring. Expectant: The casualty is expected not to reach higher medical support alive without compromising the treatment of higher priority patients. Care should not be abandoned, spare any remaining time and resources after Immediate and Delayed patients have been treated. Urgent: evacuation is required within two hours to save life or limb. Priority: evacuation is necessary within four hours or the casualty will deteriorate to "Urgent". Routine: evacuate within 24 hours to complete treatment. In a "naval combat situation", the triage officer must weigh the tactical situation with supplies on hand and the realistic capacity of the medical personnel. This process can be ever-changing, dependent upon the situation and must attempt to do the maximum good for the maximum number of casualties. Class I: Patients who require minor treatment and can return to duty in a short period of time. Class II: Patients whose injuries require immediate life sustaining measures. Class III: Patients for whom definitive treatment can be delayed without loss of life or limb. Class IV: Patients requiring such extensive care beyond medical personnel capability and time. Research indicates there are wide ranges and overlaps of survival probabilities of the Immediate and Delayed categories, and other START limitations. The same physiologic measures can have markedly different survival probabilities for blunt and penetrating injuries. For example, a START Delayed (second priority) can have a survival probability of 63% for blunt trauma and a survival probability of 32% for penetrating trauma with the same physiological measures – both with expected rapid deterioration, while a START Immediate (first priority) can have survival probabilities that extend to above 95% with expected slow deterioration. Age categories exacerbate this. For example, a geriatric patient with a penetrating injury in the Delayed category can have an 8% survival probability, and a pediatric patient in the Immediate category can have a 98% survival probability. Issues with the other START categories have also been noted. In this context, color-coded tagging accuracy metrics are not scientifically meaningful. Poor assessments, invalid categories, no objective methodology and tools for prioritizing casualties and allocating resources, and a protocol of worst first triage provide some challenges for emergency and disaster preparedness and response. These are clear obstacles for efficient triage and resource rationing, for maximizing savings of lives, for best practices and National Incident Management System (NIMS) compatibilities, and for effective response planning and training. Because treatment is intentionally delayed or withheld from patients, advanced triage has ethical implications. Medical ethics and overall bioethics have historically played an important role in triage decisions, such as the allocation of iron lungs during the polio epidemics of the 1940s and of dialysis machines during the 1960s. As many health care systems in the developed world continue to plan for an expected influenza pandemic, bioethical issues regarding the triage of patients and the rationing of care continue to evolve. Similar issues may occur for paramedics in the field in the earliest stages of mass casualty incidents when large numbers of potentially serious or critical patients may be combined with extremely limited staffing and treatment resources. Research continues into alternative care, and various centers propose medical decision-support models for such situations. Some of these models are purely ethical in origin, while others attempt to use other forms of clinical classification of patient condition as a method of standardized triage. Wikimedia Commons has media related to Triage. 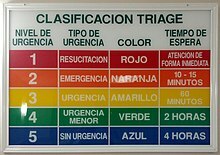 Look up triage in Wiktionary, the free dictionary. ^ "Merriam-Webster Online Dictionary". Retrieved 2008-12-05. ^ "NHS Direct website". Retrieved 2008-12-02. ^ Iserson KV, Moskop JC (March 2007). "Triage in medicine, part I: Concept, history, and types". Annals of Emergency Medicine. 49 (3): 275–81. doi:10.1016/j.annemergmed.2006.05.019. PMID 17141139. ^ Chipman M, Hackley BE, Spencer TS (February 1980). "Triage of mass casualties: concepts for coping with mixed battlefield injuries". Mil Med. 145 (2): 99–100. doi:10.1093/milmed/145.2.99. PMID 6768037. ^ Idoguchi K, Mizobata Y, et al. (2006). "Usefulness of Our Proposed Format of Triage Tag". Journal of Japanese Association for Acute Medicine. 17 (5): 183–91. doi:10.3893/jjaam.17.183. ^ Nocera A (Winter 2000). "Australian disaster triage: a colour maze in the Tower of Babel" (PDF). Australian Journal of Emergency Management: 35–40. Archived from the original (PDF) on 2011-03-14. Retrieved 2010-04-12. ^ "METTAG Corporate website". Retrieved 2008-12-05. ^ "Smart Triage Tag, (TSG Associates Corporate website". Archived from the original on 2008-11-20. Retrieved 2008-12-05. ^ Beidel, Eric (December 2010). "Military Medics, First Responders Guided By Simple Light". nationaldefensemagazine.org. Archived from the original on 2011-01-31. Retrieved 2011-02-03. ^ Lakha, Raj; Tony Moore (2006). Tolley's handbook of disaster and emergency management. Amsterdam: Elsevier. ISBN 978-0-7506-6990-0. ^ Gabor D. Kelen; Melissa L. McCarthy; Chadd K. Kraus; Ru Ding; Edbert B. Hsu; Guohua Li; Judy B. Shahan; James J. Scheulen; Gary B. Green (2009). "Creation of Surge Capacity by Early Discharge of Hospitalized Patients at Low Risk for Untoward Events". Disaster Medicine and Public Health Preparedness: S1–S7. ^ Turegano-Fuentes F, Perez-Diaz D, et al. (2008). "Overall Assessment of the Response to Terrorist Bombings in Trains, Madrid, 11 March 2004". European Journal of Trauma and Emergency Surgery. 34 (5): 433–41. doi:10.1007/s00068-008-8805-2. PMID 26815987. ^ Wheeler, Sheila Q.; Greenberg, Mary E.; Mahlmeister, Laura; Wolfe, Nicole (March 10, 2015). "Safety of Clinical and Non-Clinical Decision Makers in Telephone Triage: A Narrative Review". Journal of Telemedicine and Telecare. 21 (6): 305–322. doi:10.1177/1357633x15571650. ^ "Code Orange Plan (Assiniboine Regional Health Authority)" (PDF). Archived from the original (PDF) on December 5, 2008. Retrieved 2008-12-05. ^ "Chapter 8: Clinical and Public Health Systems Issues Arising from the Outbreak of Sars in Toronto (Public Health Agency of Canada website)". 2004-11-08. Retrieved 2008-12-05. ^ a b Mehta S (April 2006). "Disaster and mass casualty management in a hospital: How well are we prepared?" (PDF). J Postgrad Med. 52 (2). ^ "The Field Triage (European Trauma Course)". Archived from the original on 2008-12-07. Retrieved 2008-12-02. ^ Burstein, Jonathan L.; Hogan, David (2007). Disaster medicine. Philadelphia: Wolters Kluwer Health/Lippincott Williams & Wilkins. p. 25. ISBN 978-0-7817-6262-5. ^ "JumpSTART Pediatric Triage Algorithm". Chemical Hazards Emergency Medical Management. United States Department of Health and Human Services. June 25, 2011. Retrieved February 9, 2016. ^ Visser, L.; Montejano, A.; Grossman, V. (2015). Fast Facts for the Triage Nurse. New York City: Springer Publishers. ISBN 978-0-8261-2265-0. ^ a b Aacharya RP, Gastmans C, Denier Y (2011). "Emergency department triage: an ethical analysis". BMC Emergency Medicine. 11: 16. doi:10.1186/1471-227X-11-16. PMC 3199257. PMID 21982119. Retrieved 2011-12-09. ^ "Policy on the Australasian Triage Scale" (PDF). Australasian College for Emergency Medicine. November 2000. Archived from the original (PDF) on 2012-03-22. Retrieved 2011-12-10. ^ Christ M, Grossmann F, Winter D, Bingisser R, Platz E (December 2010). "Modern triage in the emergency department". Deutsches Ärzteblatt International. 107 (50): 892–98. doi:10.3238/arztebl.2010.0892. PMC 3021905. PMID 21246025. ^ "Canadian Triage and Acuity Scale (Canadian Association of Emergency Physicians website)". Archived from the original on 2008-12-10. Retrieved 2008-12-02. ^ "METTAG Triage Tags". Retrieved 2008-12-02. ^ David L. Hoyt; Wilson, William J.; Grande, Christopher M. (2007). Trauma. Informa Healthcare. ISBN 978-0-8247-2919-6. ^ "Telemedical support of emergency prehospital care in mass casualty incidents" (PDF). Archived from the original (PDF) on 2011-07-19. Retrieved 2008-12-04. ^ Beck A, Bayeff-Filloff M, Bischoff M, Schneider BM (November 2002). "[Analysis of the incidence and causes of mass casualty events in a southern Germany medical rescue area]". Unfallchirurg (in German). 105 (11): 968–73. doi:10.1007/s00113-002-0516-2. PMID 12402122. ^ "Guide to Accident & Emergency (A&E) Service". Hospital Authority. Retrieved 2012-11-29. ^ Azeredo, Thereza Raquel Machado; Guedes, Helisamara Mota; Rebelo De Almeida, Ricardo Alexandre; Chianca, Tânia Couto Machado; Martins, José Carlos Amado (April 2015). "Efficacy of the Manchester Triage System: a systematic review". International Emergency Nursing. 23 (2): 47–52. doi:10.1016/j.ienj.2014.06.001. Retrieved 2019-02-15. ^ "TSGassociates.co.uk". Archived from the original on 2006-05-19. Retrieved 2006-04-03. ^ "Major Incident Medical Management and Support Course" (PDF). Retrieved 2008-12-04. ^ Jill Windle; Manchester Triage Group Staff; Mackway-Jones, Kevin; Marsden, Janet (2006). Emergency triage. Cambridge, MA: Blackwell Pub. ISBN 978-0-7279-1542-9. ^ "US Army Study Guide". Retrieved 2008-12-04. ^ Koehler RH, Smith RS, Bacaner T (August 1994). "Triage of American combat casualties: the need for change". Mil Med. 159 (8): 541–47. doi:10.1093/milmed/159.8.541. PMID 7824145. ^ "Who dies, who doesn't: docs decide flu pandemic guidelines (CBC News Item)". 2006-11-21. Retrieved 2008-12-02. ^ Christian MD, Hawryluck L, Wax RS, et al. (November 2006). "Development of a triage protocol for critical care during an influenza pandemic". CMAJ. 175 (11): 1377–81. doi:10.1503/cmaj.060911. PMC 1635763. PMID 17116904.